Councilmen Fred Richardson, C.J. 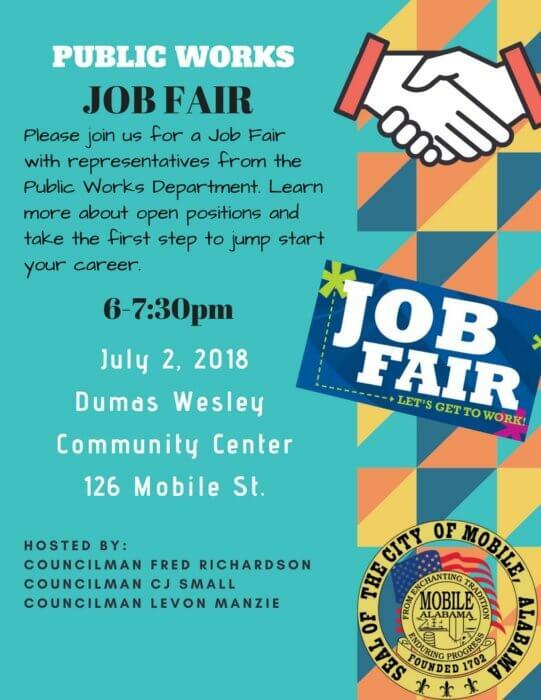 Small and Levon Manzie will host a Job Fair on Monday, July 2 from 6 to 7:30 p.m. with representatives from the Public Works Department and the Mobile County Personnel Board. The councilors hope to help fill the 20 open positions in the department through the fair. Prospective employees will be able to learn about current positions, needed qualifications and begin the application process. The event will be held at the Dumas Wesley Community Center located at 126 Mobile Street. Public Works has been a focal point lately, after it was learned that delays in garbage and trash pickup was being caused by a lack of employees.